i love half birthdays because they come out of nowhere! it’s like your own private holiday that slaps you in the face when you notice the date. my favorite things to do on my half birthday include putting half-and-half in my coffee, watching harry potter and the half blood prince, and asking everyone obnoxiously if they know what day it is. oh, and eating ben & jerry’s half baked ice cream (hence the cake). for those who don’t know, the half baked flavor is chocolate and vanilla swirled with gobs of cookie dough and fudge brownie. 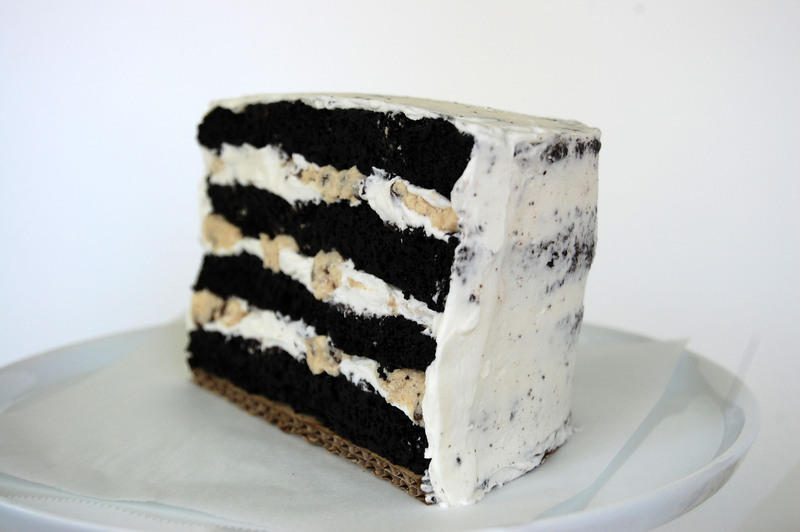 this cake replicates it pretty well: layers of velvety chocolate cake spread with smooth vanilla frosting and studded with cookie dough chunks. it would be perfect heated up and topped with a big scoop of melty (half baked) ice cream. treat yourself! for the cake, preheat oven to 300º. grease two six-inch cake pans and line with parchment paper. mix the chocolate with the hot coffee and set aside (don’t stir). whisk together the sugar, flour, cocoa powder, baking soda and powder, and salt. in a stand mixer, beat eggs until thick and lemon colored. add the oils, buttermilk, and vanilla. stir the chocolate-coffee mixture and add it to the wet ingredients. add the dry ingredients to the wet and beat for twenty seconds. divide evenly between the pans and bake for about 25 minutes – just keep an eye out and check it with toothpicks until they come out with a few moist crumbs attached. let cool for five minutes in the pan, then turn out onto a rack and let cool for at least an hour (or stick it in the freezer for 15 minutes). for the frosting, beat the butter until fluffy and lightened in color. add the sugar gradually, then beat in the vanilla and cream. beat for five more minutes, or until doubled in size. for the cookie dough, cream the butter, sugars, and salt until fluffy. add the cream and vanilla. sprinkle in the flour and mix until just combined. stir in the chocolate chips. refrigerate for at least half an hour. to assemble, cut one of the layers in half horizontally (i did this because mine were really thick; if yours are thinner you can just use both layers), then cut in half vertically. stack all the layers and trim them until they’re the exact same size. 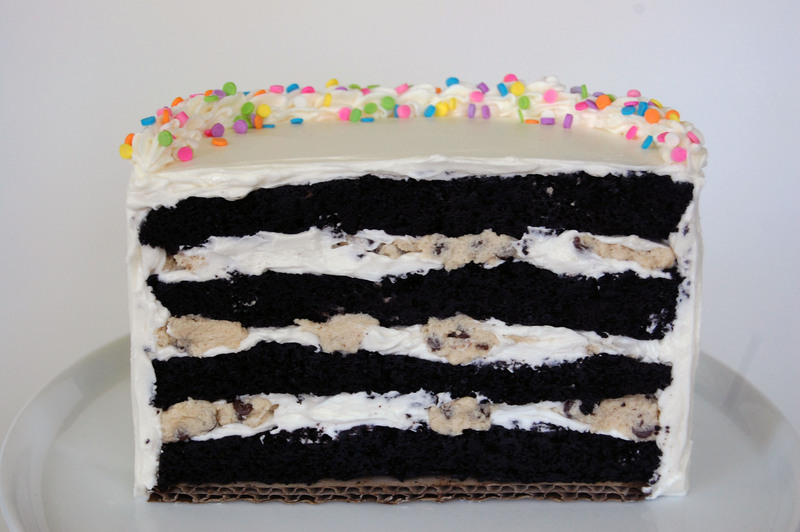 place the first half layer on a half cake circle and spread with a thin layer of frosting. roll balls of cookie dough and smush them on top of the frosting, making sure to evenly distribute them so that the cake stays level. spread with more frosting, then top with another layer. repeat twice. after adding the top layer, crumb coat the whole thing (leaving the ‘cut’ side exposed). chill in the freezer for 10 minutes, or until frosting can be tapped and doesn’t feel sticky. frost again, making it as smooth as possible. pipe a border along the top edge of the cake – i used a small closed star tip – and sprinkle with rainbow sprinkles or mini chocolate chips. other cute decoration ideas: halved mini marshmallows that have been dipped in chocolate and nonpareils, halved chips ahoy, stumpy candle halves.